Draft: 2003, Houston Astros, 2nd rd. November 6, 2010 RHP Jason Hirsh elected free agency. September 25, 2010 Scranton/Wilkes-Barre Yankees activated RHP Jason Hirsh from the 7-day disabled list. August 29, 2010 Scranton/Wilkes-Barre Yankees placed RHP Jason Hirsh on the 7-day disabled list. August 28, 2010 Scranton/Wilkes-Barre Yankees activated RHP Jason Hirsh from the 7-day disabled list. August 17, 2010 Scranton/Wilkes-Barre Yankees placed RHP Jason Hirsh on the 7-day disabled list. February 8, 2010 New York Yankees invited non-roster RHP Jason Hirsh to spring training. September 21, 2009 Scranton/Wilkes-Barre Yankees activated RHP Jason Hirsh from the 7-day disabled list. September 9, 2009 Scranton/Wilkes-Barre Yankees placed RHP Jason Hirsh on the 7-day disabled list retroactive to September 7, 2009. 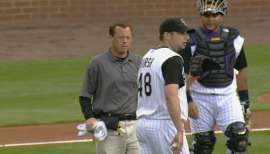 July 10, 2009 Colorado Rockies sent Jason Hirsh outright to Colorado Springs Sky Sox. April 22, 2009 Jason Hirsh roster status changed by Colorado Springs Sky Sox. April 18, 2009 Colorado Springs Sky Sox placed RHP Jason Hirsh on the temporarily inactive list. March 16, 2009 Colorado Rockies optioned RHP Jason Hirsh to Colorado Springs Sky Sox.